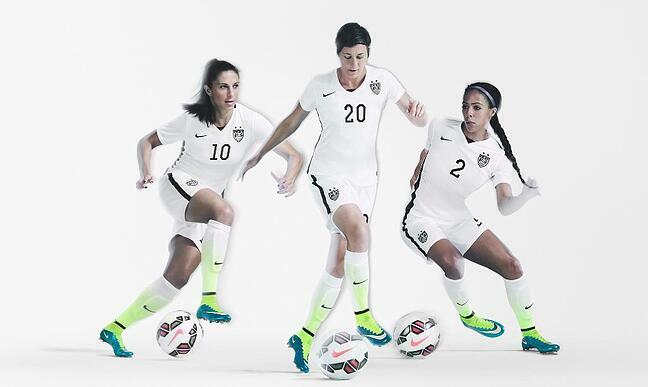 It has been a few months since the United States won the 2015 FIFA Women's World Cup, but the buzz is still going. A lot of that talk is surrounding the custom fan gear designed by Nike, which continues to be a hit with soccer fans. Coaches, athletes, league managers, and anyone else who is in charge of ordering fan or team gear should get out their notepad and learn from the pros. When Nike revealed the home team kits and custom soccer uniforms that the US Women's National Team would be wearing for the World Cup, people criticized the home team apparel for not representing the traditional red, white, and blue colors of the American flag. On the other hand, many others applauded the unique, sleek design of the team gear. The mostly white home team kit features black and neon yellow details. Player names and numbers are printed on the back in a modern typeface that was "designed specifically for U.S. Soccer." Nike also incorporated environmental sustainability into the new design - the kits were created with recycled plastic water bottles. The functionality of the gear is important for any team, whether you are a professional athlete or on a high school club team. These custom jerseys and shorts quickly wick away sweat and provide for easy ventilation and air circulation. “If you look good, you are ready to play well, and when I wear this on the pitch, I feel inspired to play well for my country, our team, and the fans." Fans who watch and play the sport appreciate the functionality of team apparel just as much as the athletes do. This is because they can represent and continue to be inspired by their favorite team and individual players while they are working out or practicing (or just hanging out and watching the game). The custom soccer team uniforms and fan gear designed by Nike are great examples of nontraditional uniforms that fans get excited about. While not everyone is in love with the new gear, the colors and design are certainly unique. And fans of all ages are buying it. Fans can purchase jerseys and other tops and shorts depicting the three stars that show off the team's three World Cup titles. Other team gear is available as well, including the standout cleats.The custom cleats were designed to blend with the neon volt color of the socks, and are topped off with an electric blue border and classic Nike swoosh. Men and women young and old showed their support of the team, and continue to do so, by ordering their own team gear. In fact, Nike struggled to keep up with the demand of fan gear and replica jerseys after the women's team won their third World Cup title. The US Women's National Team will face off against Brazil on Wednesday, October 21st in Seattle as part of their 2015 Victory Tour. While your team may not have a victory tour planned for any time soon, the US Soccer online shop is still a great inspiration for your own team and fan gear online store. Design branded fan gear that your team is proud of and can use as a fundraising tool. Does your team have hordes of raging fans or parents who would love to show their support? Open your own team apparel and gear shop with the TeamLocker™ solution!